First offered in 1864 as Texas Pole, then renamed Old Homestead, it was then reintroduced as Kentucky Wonder Pole in 1877. By 1901 it had become so popular that it was listed by over 280 companies. Large vigorous plants grow 5-8' tall and produce clusters of green flattened oval stringless pods of excellent flavor, 7-10" long. For best flavor and yield, pick pods when young (about 5 to 4 inches). Beans prefer warm, dry soil so it is best to wait and plant in Late Spring. Rough poles or a trellis of fence 8 feet high are needed for vine support. Cover seeds with 1 inch of soil. Plant 4-6 seeds around each pole and thin to 3 to 4 of the strongest plants when 2-3 inches tall. Along fence plant every 4-6 inches and thin to 1 foot apart. Germinates in 6-10 day depending on conditions. 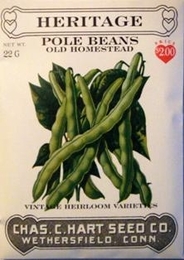 Bulk Heirloom Pole Bean seed available. 70-90lbs of Heirloom Pole Bean seed needed per acre. Average Heirloom Pole Bean yield per acre - 172 bushels.